Villa San-Juliette is committed to advancing the reputation of wines grown in the Estrella District of the Paso Robles AVA. The star of the show is our 130-acre estate vineyard, which is home to twelve remarkable grape varieties. The vineyard’s combination of soils, aspect, and elevation create exceptional Bordeaux and Rhone-style wines with richness, depth and varietal typicity. Sustainability and environmental responsibility are passions of ours at Villa San-Juliette. As of 2013, we are proud to be SIP Certified through a rigorous auditing of our growing practices and vineyard operations. SIP Certification – Sustainability In Practice – is a comprehensive process carried out by the Vineyard Team that represents so much more than “green” or “organic” wines. SIP Certification seeks to build community between vineyards, workers and the land. The result is a network of farmers and winemakers passionate about leaving a lasting, healthy legacy to the next generation. The standards by which SIP Certification is measured address several aspects of the whole farm system, including habitat conservation, energy efficiency, pest management, water conservation, fiscal responsibility and human resources. 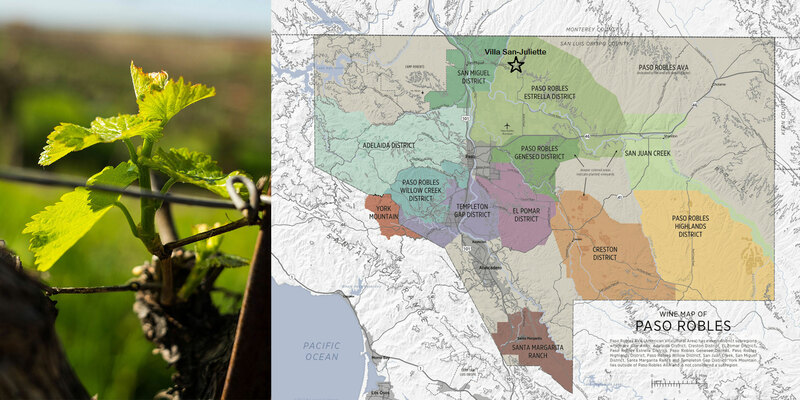 This approach, which is much broader than organic, biodynamic, natural, or other eco-labels, takes into account the lives of those who work to make the wine, the health of the soil, wildlife, native plants, irrigation, and much more. VSJ irrigates vineyards during off-peak hours when energy demand is at its lowest (at night or in the morning) for energy efficiency and to avoid evaporation. Fertilizer applications are timed to maximize nutrient uptake and to reduce the potential for non-point source water pollution. All soils on the VSJ property have a low erosion hazard. The primary Soil Series present include Nacimiento-Los Osos complex and Rincon clay loam. All slopes are less than 30%. Good ground cover and erosion practices have and continue to prevent erosion hazards. Slopes are manageable and row direction is set to optimize soil health.